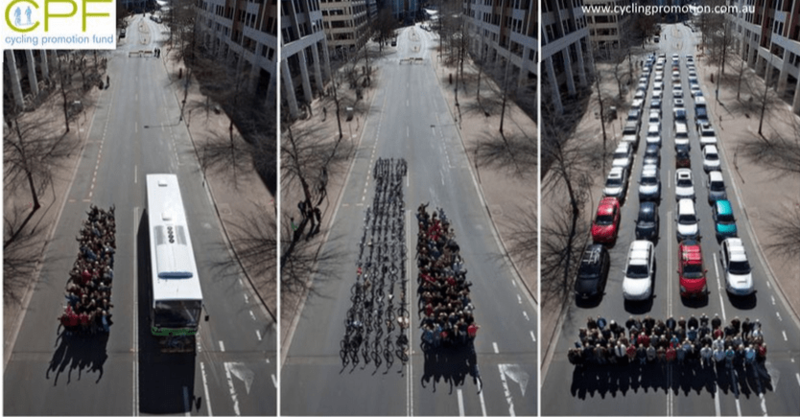 In the image here, all the cars journeys on the right (which in Bath are in one long stream not 4 lanes) can be accommodated more comfortably and more quickly in the bus on the left. This frees the road for essential car drivers, other diesel buses and taxis. A 38 m tram will accommodate even more car drivers who, experience shows, will switch to trams but not buses. Out of town off-loading of HGV freight to trams can be carried out at out of town tram stops – this does not require a freight consolidation depot, and can occur on a ring around the town, not just at one location as at present. 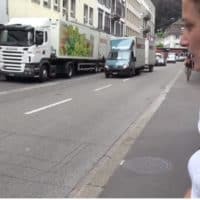 This reduces the numbers of trucks not only entering the city but it also eliminates the inevitable 20 minute road blocking when trucks are unloading a few pallets. 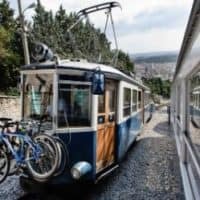 In comparison these take only a few minutes to drop off from a typical low-height tram and which can be wheeled by hand great distances across the city. The cost of the City staff to receive wheeled pallets and wheel them to destination is much less than the cost of a typical hours entry, unloading and exit time for the HGV. Coach-to-tram drop off points at numerous standard city edge tram stops would eliminate city centre coach parking space enabling it to be sold off for prestige accommodation, in Avon Street. The entry, exit and re-entry trips for coaches using the drop off point at Terrace Walk ( “Bog Island”) and the unpleasant and slow entry into the city for coach tourists and the equally slow exit would also go. Extra shopping time would be created for coach to tram visitors. Experience shows that people will use trams (but not buses or trolley buses) in preference to their cars for many reasons, principally because they are perceived as more prestigious than buses – “Anyone travelling on a Bus who’s over 30 is a failure in life”– Loelia Duchess of Westminster (often incorrectly attributed to Margaret Thatcher). But also because they are quicker, quieter, more comfortable, cleaner, more frequent (typically one every eight minutes) and more reliable. Reliable because although trams and tram networks are capital intensive they are cheap to run and once built the operators are keen to keep them running. Trams which are generally bespoke systems designs cannot be arbitrarily withdrawn or switched to other routes or easily sold off unlike buses. Due to the carefully engineered and accurate track placement trams do not suffer the severe random shocks and vibration of buses when they encounter bumps in the road, or they deviate to avoid them. In fact trams can travel at 50 mph (not suggested for Bath) with people comfortably standing, whereas a similar bus would be injuring the standing passengers due to the violent movement encountered. Trams can accelerate and brake faster than buses without the violent jolt of gear changing, due to the electric motor and so journey time is reduced and comfort increased. The hills, narrow streets and curves of Bath are not a barrier to trams. 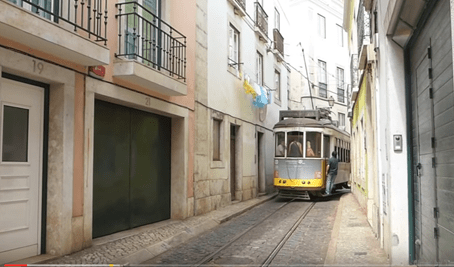 The 75 year old trams in Lisbon still operating from before the demise of Baths’ trams ascend hills steeper, traverse narrower streets and with curves tighter than those needed in Bath and are a vital part of its transport system. 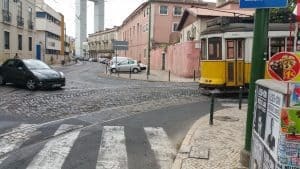 You can see how much steeper than Bath is this 1925 tram in Lisbon by looking at the window angle. 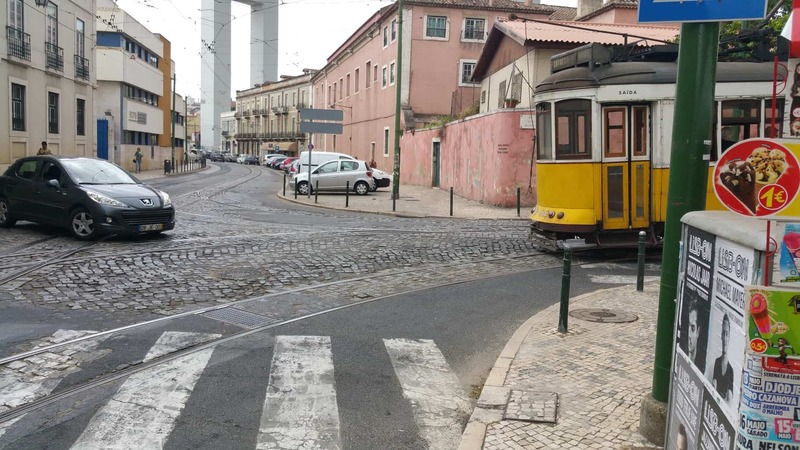 In fact, by remaining on a fixed unchangeable track, unlike a bus or truck which wanders, trams can negotiate narrower streets and pass closer together than buses or trucks. 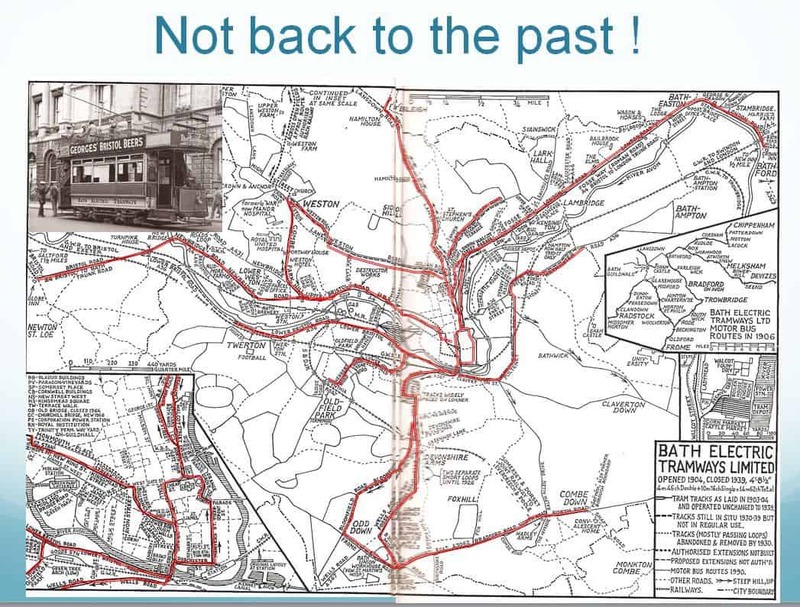 The same narrow roads down which Bath’s previous trams could run are still there and so clearly trams can negotiate these same narrow roads and tight bends. The big advantage of trams in ice and snow is that only the width of the track surface needs to be completely cleared, not the whole road width. This is something trams can easily be equipped to do for themselves; Bath had a ‘snow broom’ car to keep the tracks clear (as did most cities with trams). They can also drop sand directly onto the rails. When the M.O.D. had an important base at Lansdown in the 1960s or ’70s, it was considered vital that Lansdown Road was never allowed to become impassable. Under-road electric heating pads were installed on the vulnerable bits. I never heard of them being used and I don’t suppose anyone remembers them now. 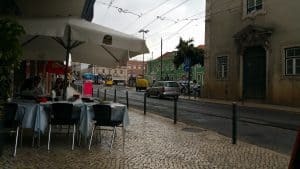 They heated the whole width of the road, which was very wasteful, and they were vulnerable to damage by movement of the surface under heavy traffic. is needed under the road because the heating current can be passed directly through the rails themselves. 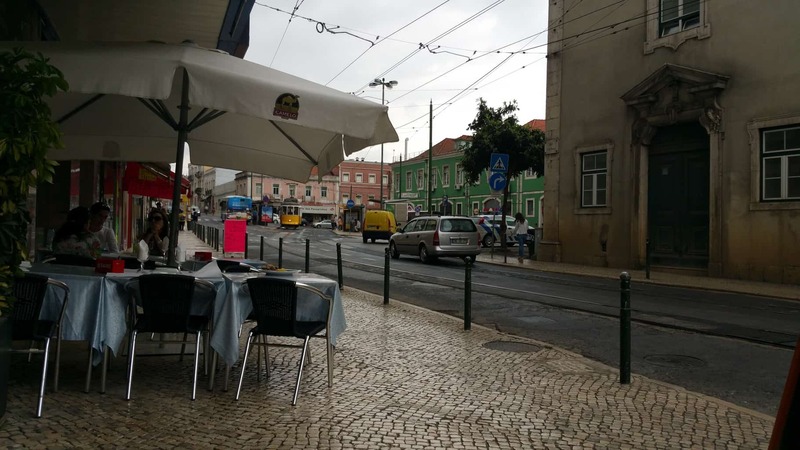 Sitting next to a tram route is a pleasant experience due to the lack of traffic and relative silence of trams; this can lead to increasing catering revenues. Sitting on a bus and truck route in Bath is extremely unpleasant due to the roar of the diesel engine cooling fan, but pleasant in a tram town. Ingenious modern methods mean that tracks can be laid very quickly overnight, one side of a pair at a time not therefore requiring road closure, without serious traffic disruption. Furthermore this can be done relatively quietly at night. 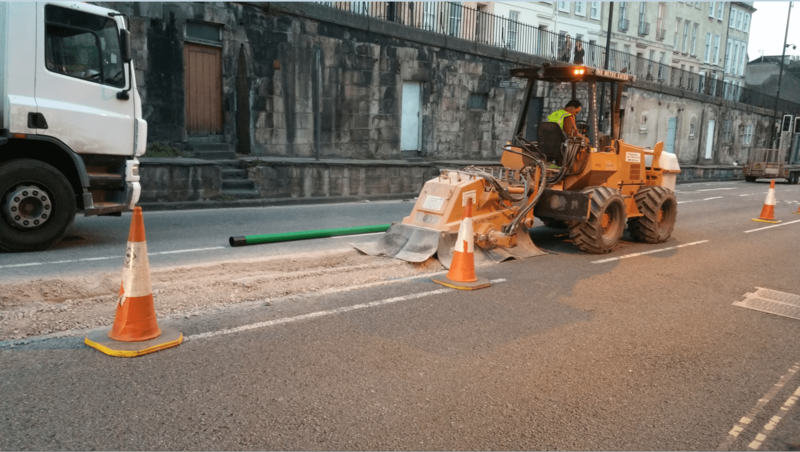 The work consists of installing a single 400mm wide and 200mm deep concrete beam in the roadway one at a time, not both tracks, and does not require any service diversions and can be installed on all existing Bath roads without deep excavation or reinforcement since the imposed load at the base of the LR55 is less than that of an existing truck wheel at the same depth. This is unlike the ill-conceived Edinburgh tram system, which contrary to expert advice utilised a sleepered railway type track requiring deeper foundations, mass service diversions, and extensive lengthy road closures. Bath regularly exceeds the legal compliance levels for air quality parameters. 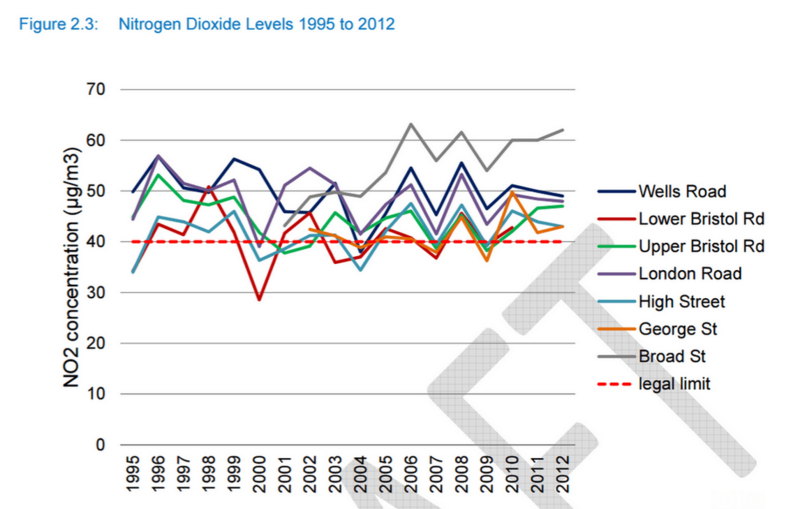 The graph here shows the reported levels of nitrogen dioxide at several locations in and around the city and the legal maximum level. 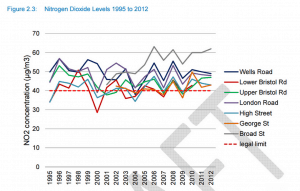 Results from automatic monitoring of nitrogen dioxide in 2012 show that all sites except at Saltford exceeded the annual average objective (two diffusion tube monitoring locations on the A4 in Saltford did exceed the annual average objective). All these sites are within Air Quality Management Areas. The trend data shows that 2012 was not a peak year for NO2, with monitoring results being similar to previous years, 2 sites were lower than 2011 and 3 sites higher. In fact and equal amount of pollution comes from tyres, tar and road dust, and this is more toxic than diesel particulates. Rather than coach tourists having to struggle through traffic to the Avon street car park (already congested and blocking car traffic by queued coaches straddling the road) in an overheating coach, they could be dropped off at any of 5 standard out of town tram routes and then zipped into the city centre in speed and style more quickly than in the coach, leaving more time for shopping and spending money with Bath’s retail businesses. The coaches could then move on and leave space for more coaches. There would be no need for the 4 journeys to coach drop off-point (in-out to drop, then in-out to retrieve) in the city centre such as Terrace Walk (“Bog Island”). 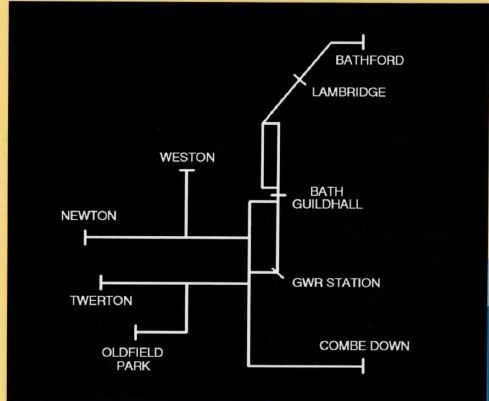 During the highly popular Christmas markets, coaches are parked (having driven into and out of Bath to drop off passengers) along the dual carriages of both Wellsway and to Newton St Loe. A possibility for making these dual carriageways Park and Rides is therefore to permanently close one half of each of the dual carriageways in Bath and use the closed carriageway as a park and ride and tram pick up point, and to convert the other carriageway to normal single lane. This was done at Rossitter Road recently. This could apply on the roads to the Globe at Newton St Loe and the Wellsway dual carriage way. These dual carriageways do nothing to improve vehicle journey times bar a few seconds, and they merely speed the Bathwards drivers to traffic congestion. 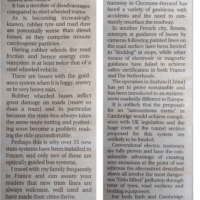 Far better for all concerned to leave cars on the closed half of the carriage way suitably remodelled, and speed into Bath on a tram at a faster pace than they would if sat in traffic queues and with no hanging around to find parking space. 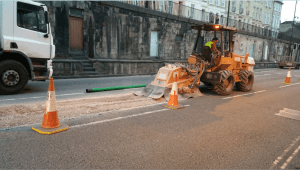 There are precedents for this in addition to the Christmas markets – for example the Newton St Loe dual carriage way was half closed for a week for grass cutting recently. One problem with existing park and rides is that due to the rate at which buses can circulate which is much longer than the 8 minutes available with trams and the inevitably longer time taken for passengers to exit and board the bus there is always a disgruntled queue. Trams have the property of being inherently quicker to both exit and board since multiple and bigger doors can be provided. Coupled with their greater frequency – 8 minutes – queuing will be eliminated and people are far more likely to use them rather than to try and drive in and use the car parks. Again this increases shopping. Low cost funding is available for tram networks and many conservative funders such as US teacher pension funds are happy to invest in long term infrastructure such as trams because they know they will be in existence for at least 60 years and have a solid counter party. Thus we do not expect the Council to have to come up with the funding. We are actively pursuing this route which will include initial funding for the essential pre-feasibility and full feasibility studies by experts consultants in this field. Relocating parking spaces out of Bath would mean that land such as the Charlotte Street Car Park could be sold off for prime luxury apartments. Installation of fixed transport routes i.e. 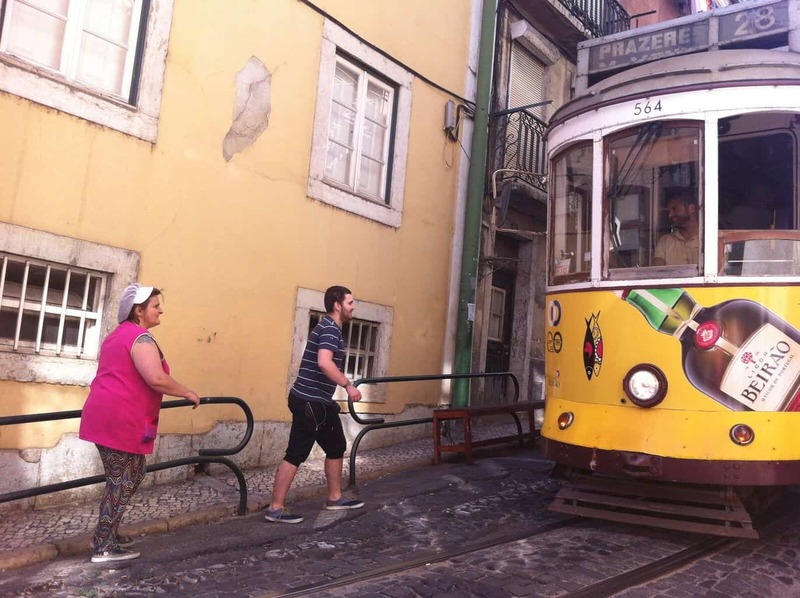 trams has been shown to increase land and property values – planning gain. 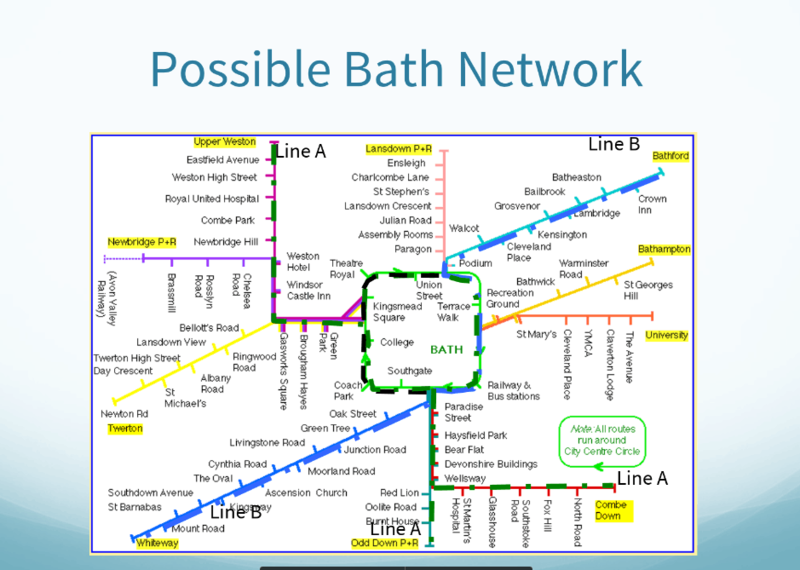 Potential routes for Bath Trams as above and below – engineering surveys indicate that all the routes shown are wide enough for trams without special dedicated routes. 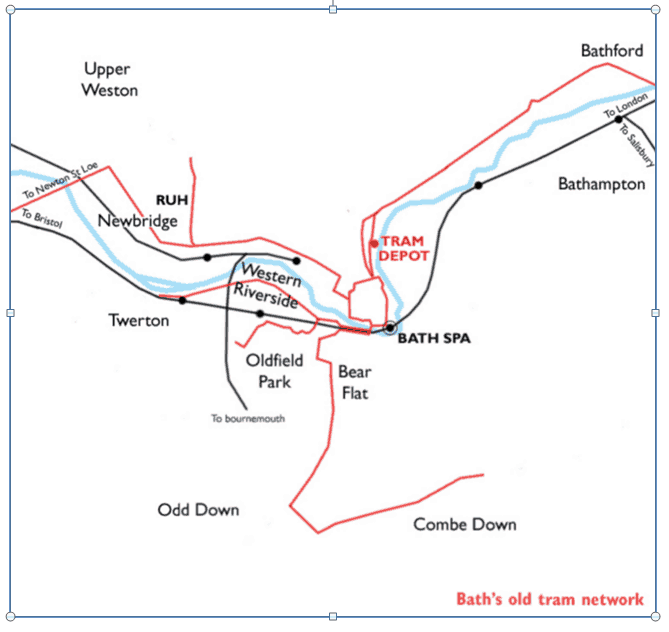 Below are some maps which indicate the routes taken by the old trams system – note this is the reason that Bath and its suburbs are the layout they have. 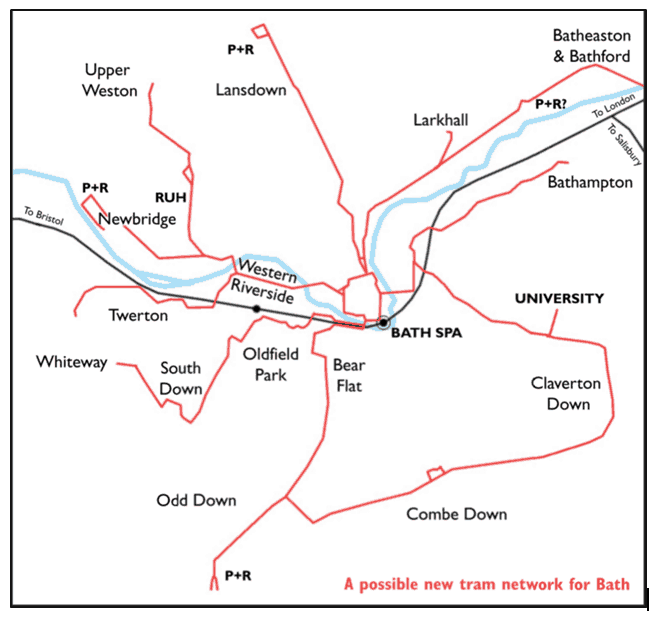 To address all Bath’s transport related issues, an overall strategic plan needs to be developed, integrating the proposed tram system, the park and ride sites, the A46/A36 link road, traffic restraint, existing parking policy, the the proposed link to Bristol, the future of self-driving cars, and all other aspects such as pollution into an integrated whole. Bath Trams proposes an initial pre-feasibility study to check if it likely to be worth proceeding further, and if so a fully feasibility study, which includes all the above elements. This would then be followed by a full engineering design and costing to permit tenders to be placed.